It’s almost the 14th and you haven’t ripped out the February page in your month-at-a-glance date planner. Good for you! This Pfizer-fueled holiday turns the next few days into a blur of reds and Godiva golds populated by hordes of smiling couples as far as the eye can see. Relax. You’ve got options. Somewhere between letting it all hang out in a red dress with a plunging neckline and hiding behind a black veil, there’s a lot of gray area for a widow on Valentine’s Day. Remember, this holiday will be gone in a blink, red and pink heart silhouettes replaced with glittery green shamrocks before you can say, ‘Get me out of this Hallmark hell!’ But for now? Snap out of it! And shift your focus. Valentine’s Day doesn’t have to be about being alone and not having a special someone. 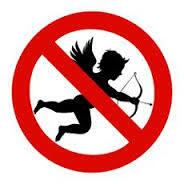 Cupid’s calendar doesn’t have to be a mandate for misery. Make the day work for you by anticipating The Big Red Dread. Entertain – Host a dinner for single friends. Give a shout-out to those in your circles who are facing February 14th with similar feelings. If you don’t feel confident or comfortable to host a party, suggest the idea to a friend and offer to help. Don’t. Dine. Out. – Do not venture out to a restaurant. Trust me on this. Everyone from Dr. Oz (‘look thinner for Valentine’s Day’) to Victoria’s Not-So-Secret has been advertising, hyping this holiday into the Super Bowl of romance. With Valentine’s Day falling on a Saturday, it’s inevitable that restaurants will be bursting at the bars with smiling libidos, intent on love, or some reasonable facsimile. Resist all temptations to dine out. To paraphrase Nike: Just don’t. Good Samaritan – Do a good deed. Offer to babysit for a couple that needs a night out. Visit an elderly relative or neighbor who needs company. Couch Potato – If you’re thinking of opting out of Cupid’s calendar – go for it! Let your gut be your guide. Maybe it’s a day for binge-watching. In this golden age of TV with plenty of must-see entertainment, there’s no reason not to use this perfectly good Saturday to catch up on some of the great programming out there. Join Netflix. Upgrade your cable. Rent movies. Let yourself be entertained and distracted. Me, Myself & I – Remembering Valentine’s Days past is inevitable. It’s not just about acknowledging the pain of the loss, but also embracing your memories. Make a date with yourself. In the privacy of your home, with no one to judge you, bring out the old photos and cue up your wedding video. If you’ve been wanting to do this, there’s no better day of the year than Valentine’s Day. Grab a box of tissues, curl up in bed with the photo albums and remote control, and let the tears come. For some, it’s a necessary step in moving on; for others, it brings a sense of comfort. Give in to yourself. Focus on the Future – You may not have a date this Valentine’s Day, but that doesn’t mean a future February 14th won’t find you in love again. Be open to possibilities. Be good to yourself. When you’re ready, let love find you. Again.